There's something special about a wooden boat. The way it looks. The way it moves through the water. The way it feels. The way it makes you feel. Some will tell you that a wooden boat has a soul. We agree. 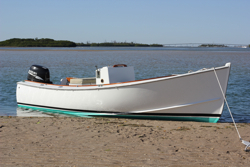 Here at Six River Marine, we've been building, repairing, restoring and caring for wooden boats in the finest Maine tradition since 1995. Over the years, we've continually strived to refine our skills in both traditional and modern building techniques with one goal in mind; to efficiently provide our customers with finely crafted work that ensures lasting value. We invite you to explore our web site and learn a bit more about what we do, how we do it and how we might help you with your wooden boat project. Thanks for visiting with us today. This West Pointer 18, built in 2004, is now for sale. She is hull #1, and has been well cared for by her original owner. She's also received a number of upgrades over the years, and a fresh Awlgrip paint job this year. If you've ever dreamed of owning your own West Pointer 18, this is an opportunity not to be missed. For more information, please contact Chip or Scott.